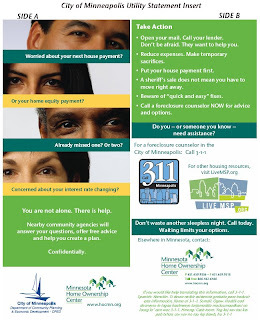 On March 12th, the City of Minneapolis approved the use of a "Utility Billing Insert" that the Center created to notify Minneapolis home owners about the existence of local, FREE counseling services. Working with the City's Community Planning and Economic Development department, the Center designed a flyer that would link struggling homeowners to the City's 3-1-1 line, as well as linking them to other housing resources available at LiveMSP.org. These partners will, in turn, connect homeowners to the Center's network of foreclosure counselors. The insert should reach close to 100,000 homes in the city! In the past few years, the Center has worked with dozens of other utility companies, municipalities and other organizations to mail over HALF A MILLION similiar flyers to homeowners throughout Minnesota. Would your organization like to be next? Contact Ed Nelson at the MN Home Ownership Center to talk about how your organization, company, utility or municipality can partner with the Center to get the word out about trustworthy non-profit foreclosure counseling services available in Minnesota. Don't let your friends and neighbors get taken advantage of by unscrupulous foreclosure prevention "Agencies"... help them get connected to the Center's network of community-based (FREE!) counselors today. HAMP, HARP and Now HAFA too?